Packing for a backpacking trip can be a daunting task. How do you know you have everything you need? And, for an added challenge, how do you fit all of that gear into a single pack? A little bit of planning and careful organisation can ensure that your first wilderness experience is a success. Start with what you’ll need for each part of the day. Bring a tent, a sleeping bag stuffed into a compression sack, a sleeping pad, and a headlamp for sleeping. For cooking, make sure you include a stove, fuel, a lighter, a cooking pot, food for each meal, a bowl, and a spoon. Pack water (two litres is a good start) and a way to purify water in the backcountry – either a filter or purification drops. The last things to pull together are miscellaneous, yet often essential items, such as a first-aid kit, maps, and a compass (or GPS). Time to pack: Start by putting aside everything you may need in the middle of the day (snacks, map/compass, first-aid kit, rain jacket, etc.) These items can go in the top compartment of the pack, where they’ll be readily accessible. Once that’s done, work from the bottom up, always keeping three things in mind: accessibility, balance, and compression. Pack things in the order you’ll need them – you don’t want to repack the whole bag halfway through the day because you buried all the food. Balancing the weight on each side of the pack will make your backpack fit more comfortably and keep you from wobbling down the trail. Here are a few more pro tips: pack the tent poles along the inside of the bag but not inside the liner. Try to pack things inside your cookpot to prevent wasted space, and make sure you separate the food from the fuel. To help fill in dead spaces and cut down on pack weight, take your tent out of its bag and stuff it into the crevices of your pack. 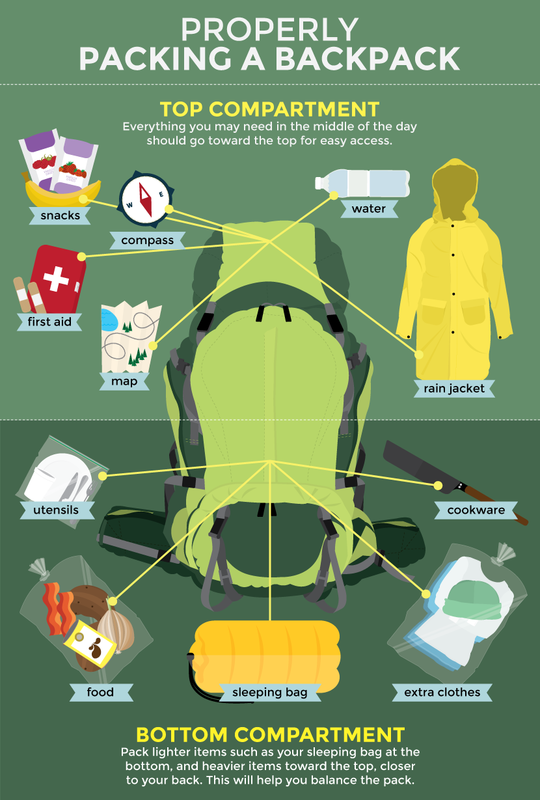 Check out the rest of our tips for packing a backpack in the original article by Alison Hudson. Here at The Outdoor Type, we are interested in exploring what inspires others to step outside. The outdoor experience is personal and unique for all outdoor types and the wonderful stories people have to tell from their experiences - whatever the method or medium - are equally inspirational. We are constantly in search of creative new stories and images that explore the outdoor experience. Contact us here if you are interested in writing for us.